for Europe, Tyco Fire and Security UAE for the Middle East, and Acti-Tech for Africa. The winners were announced at the prestigious and annual CEM EMEA Conference, Belfast. CEM resellers supply, install and service CEM security management systems throughout the world. As CEM Business Partners of the Year for EMEA, resellers are recognised for their work in delivering complex integrated projects and helping to grow the CEM business in their respective geographic markets. FES Group received this year’s award for UK & Ireland in recognition of their excellent technical expertise and ability to deliver large, integrated solutions particularly within Educational and Healthcare environments. FES Group also exhibited commitment to training and gaining understanding of the value proposition of the CEM advanced offerings and are proactively promoting the solutions widely. “It is great to be recognised by CEM as their UK & Ireland business partner of the year 2016. Together we have secured some great customers, and we look forward to further success as we continue to build our relationship,” said an FES Spokesperson from the Fire/ Security & Alarms Services Division, FES Support Services. Tyco Integrated Fire & Security, Netherlands won the award for Europe. Their success was attributed, among other things, to their industry leading experience in deploying integrated projects throughout The Netherlands. “CEM’s AC2000 access control and security management system provides a highly secure solution that integrates with a range of third party security providers, including video, fire and intrusion. This makes it the ideal choice to deploy in complex projects. AC2000 can also be deployed by customers using one central server for multiple buildings. This architecture saves customers money and is more flexible when they need access control in multiple sites,” said Hugo van Vliet, Account Manager High End Security, Tyco Integrated Fire & Security. The security experts Tyco Fire and Security UAE were given the award for Middle East in recognition of their continued success in representing and promoting CEM in the region. 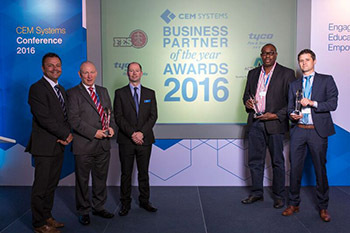 “This award is great recognition for the work we have done with CEM Systems to secure a range of prestigious customers throughout the year,” said Craig Menzies, Security Division Manager, Tyco Fire and Security UAE. In the Africa category, market leading security distributor Acti-Tech was awarded for their project work and for their continued investment in supporting CEM through their demonstration facilities and major African exhibitions. “We are delighted to accept this award. CEM’s AC2000 access control continues to provide the highest levels of resilient and scalable security, which we have successfully deployed in the government, public, private corporate sectors and many others. We look forward to continuing to build our knowledge of CEM solutions, and developing our relationship with CEM,” said Augustus Chalokwu, CTO, Acti-Tech. CEM Systems is part of the Security Products business unit of Tyco, the world’s largest pure-play fire protection and security company. CEM provides highly advanced security management solutions which include integrated access control, ID badging, alarm monitoring and the industry’s most advanced and flexible range of card readers.